You are currently browsing the tag archive for the ‘supermarket’ tag. As I was making soup today for dinner tonight I was chopping up the vegetables. As I was chopping the celery it occurred to me that while I love the winter, I do miss the ease, satisfaction and good taste of those homegrown vegetables that are prolific during the summer months. As I stared at the store-bought celery on my counter, the word that popped into my mind was “anemic”- pale, lacking color. I remember wistfully the dark green leafy celery that grew so darn well through the entire summer. When I needed celery for soup or salad or whatever, it was there for the taking. A whole bunch or a couple stalks. Now, until well into the summer of next year, I have instead the pale vegetables to look forward to seeing. The celery that is about 10 shades lighter than mine and the tomatoes that look too orangey-pink to call themselves red are abundant in the supermarket. Sadly, the farmer’s market around here just doesn’t have these kinds of things during this time of the year, although they will appear far quicker at the market than they will in my yard. 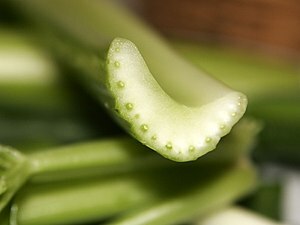 I would be curious to find out the difference, if there is one, between the nutritional value of my celery (or any fresh farm grown celery) compared to the ones available in the supermarket, which seems that it must contain less nutrients just by virtue of its pale color.